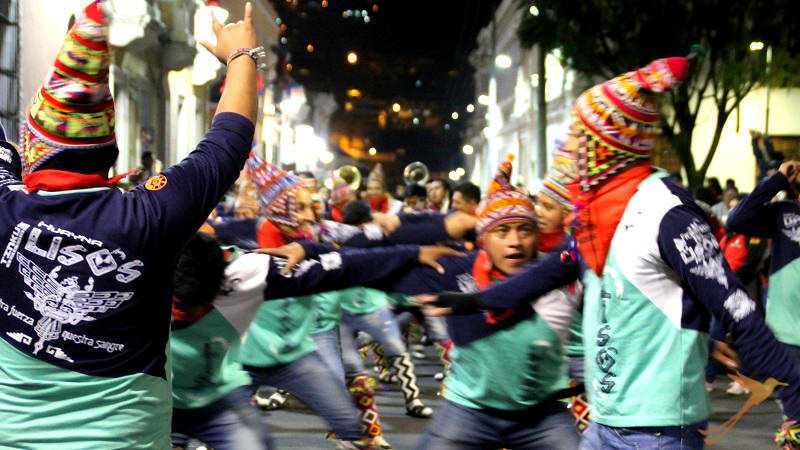 Although I have lived in Ecuador for three years I never made it to the Fiestas de Quito, the celebrations of the foundation of the city. So this year I was really looking forward to it and was curious how it would be like. We already wrote an article about these famous festivities, their history and traditions. Today I want to give my personal review of the celebrations. 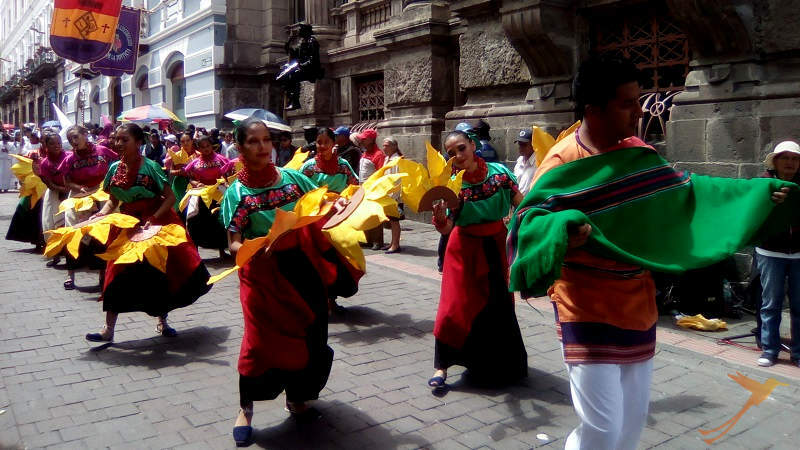 I went to two specific events of the festivities and spend some afternoons in the historic center of Quito to admire the decoration and explore local customs and celebrations. 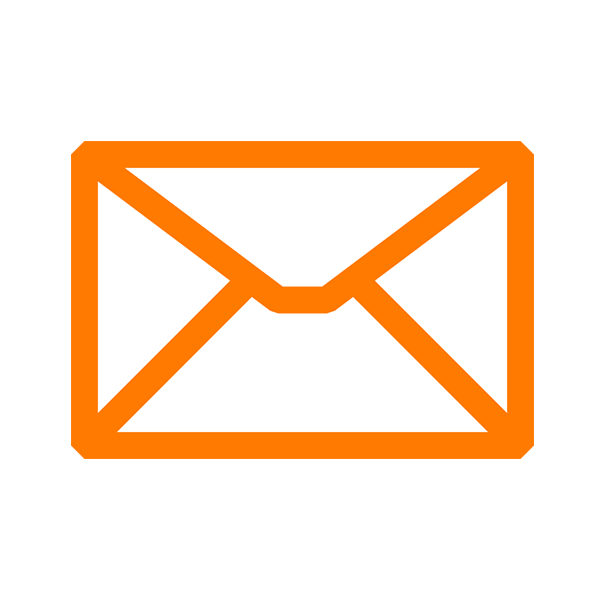 Generally, it was quite difficult to obtain information about smaller events. There were many announcements and publicity in the social media for the big concerts but to find less commercial activities you had to come across them accidently. So did I a few times and it turned out an interesting experience. The first encounter with the celebrations took place last Thursday, when I joined my colleagues to review a restaurant in San Marcos, the oldest neighborhood of Quito. After leaving the restaurant, on the street, we came across a parade of dancing school students who presented traditional Latin American dances and were accompanied by a Bolivian orchestra. I, having a passion for dances, was very enthusiastic about it. At the same time there took place the inauguration of the Quito Archives Museum with a photo exhibition, more music, games and canelazos. It was a very nice evening and it ended with a delicious pizza in a nearby restaurant. One event I wanted to go to was the so called Carolinazo in the Carolina Park in the north of Quito last Friday. After work and relaxing a while I took the public bus from my accommodation to the park. It took ages because the streets were so packed. 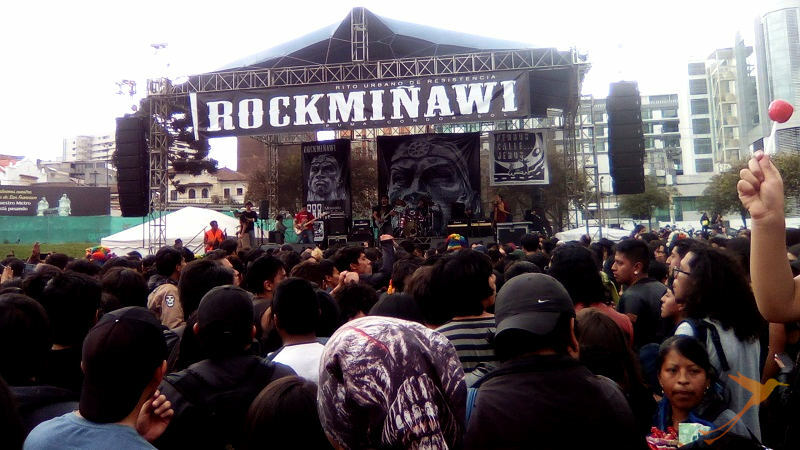 Although I didn’t know any of the groups that were announced I was curious how an open air concert in a public park in Quito would be organized. Finally, I reached the Carolina and could already hear music. It turned out to be a very well organized event: the stage was located on the meadow within the running track which was surrounded by a fence. You could only get in at certain points and after being checked by the police. Beyond the fence there were lots of stands selling all kinds of food and non-alcoholic beverages. Officially it is not allowed to sell alcohol during the fiestas but it’s hard to avoid on events like this. You always find someone who offers the non-alcoholic canelazo bottle and besides sells the liquor in a plastic back or glass. There were many, especially young people who had brought their prepared bottles to warm up before getting inside the concert area. I walked around outside and inside and enjoyed the music and the festival feeling but I didn’t stay so long because I got cold. On Saturday late afternoon I went to the old town. Although there were no specific events here right now, there were many people and a lot of street artists. On Plaza Grande took place a circus performance and on the Garcia Moreno street you could admire a violinist, marionettes artists, a harp player, bracelet weavers and much more. The next day I came across another interesting event. I was walking through the Ejido Park when I heard music from the direction of Casa de la Cultura. It came from an event which is called Rockminhaui. 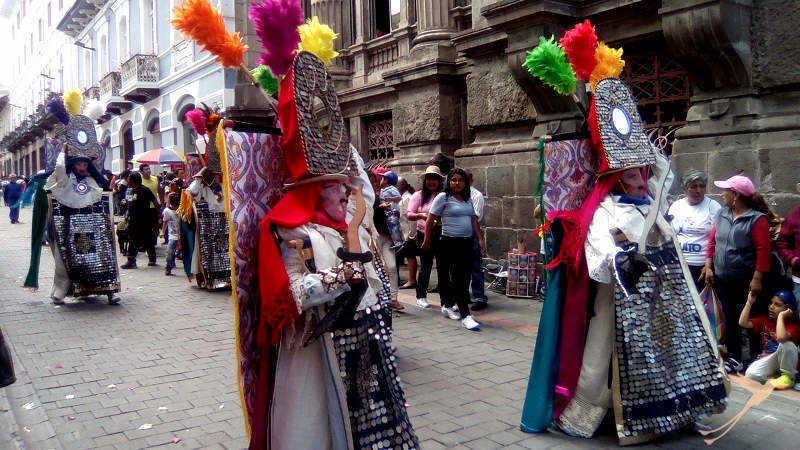 It takes place every year and is actually a protest event against the celebration of Quito’s ‘foundation’ on December 6th of 1534 Quito by the Spanish colonists. There was a settlement in the area of the city long before the Spanish came and obviously many other cultures. Since the event had a more rebellious character the music was pretty alternative: rock, punk, metal and there were lots of mainly young, black-dressed and long-haired people jumping around. It was really fun to watch although this type of music is not really my taste anymore. However, my first personal highlight of the celebrations took place on December 5th. All over the city there were concerts but my aim for today was the “noche de las plazas” in the historic center. After work I took the trole bus to the center and got off at Santo Domingo square. On the square was a stage but not so many people yet. I went towards San Francisco square and stopped at the Garcia Moreno street to watch the colorful parade of dancers and musicians moving from La Ronda to Plaza Grande. Later I got to San Francisco square where the concert had already started. There was an Ecuadorian band playing chicha – typical Andean party music. I stayed for a while and later moved to Plaza Grande. The lights were really beautiful – blue and red, the colors of Quito. 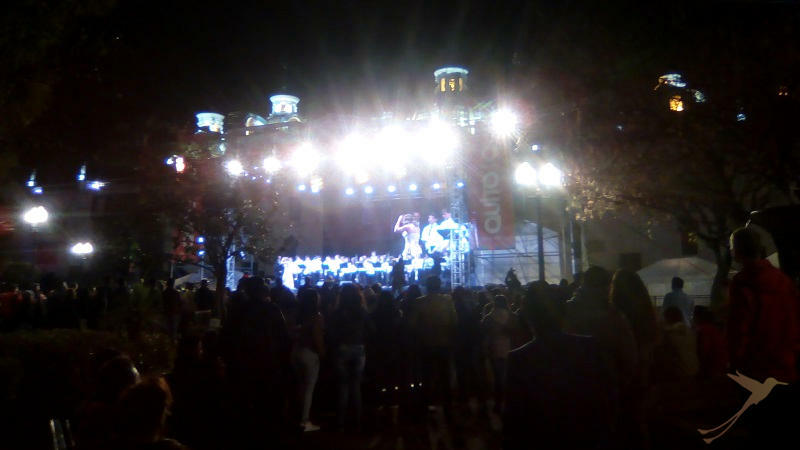 The theme of Quito’s main square was serenades and there was an orchestra of students playing and an obviously famous female singer singing. The square was full of dancing people and very nice atmosphere. Later I went again to Santo Domingo square where meanwhile the band ‘Curare’ was playing that I had heard at the Rockminhuai and really liked. I kept walking and returned to San Francisco square to see the concert I had been looking forward to for weeks: the Gipsy Kings. I really could not believe that this famous group would come to Quito to give a concert for free and I’m still in doubt if it was really them or a perfect cover band. But anyways, they were great! I stayed till the end of the concert and then, very happy, took a taxi back to my accommodation. My second highlight of the Fiestas de Quito was definitely the reunion of the SOLEQ.travel staff for playing cards and drinking canelazo on Thursday. We played ‘cuarenta’, a very entertaining card game. At the beginning I was very confused by all the rules but then I got really into it and had a lot of fun. We all had actually. Later that evening I went with some friends to the Shyris Avenue where the party continued on the street. There was no live music nor DJ, just music from the speakers of people’s private cars and almost everyone was dancing. It was real fun. On Sunday I went again to the old town where the last celebrations of the Fiestas took place. There was live music from an Andean music quartet and especially older women were dancing. It was very entertaining to hear and observe the scenery. Later there was another colorful parade on Garcia Moreno street. Under bright sun this was a nice ending of the Fiestas de Quito. 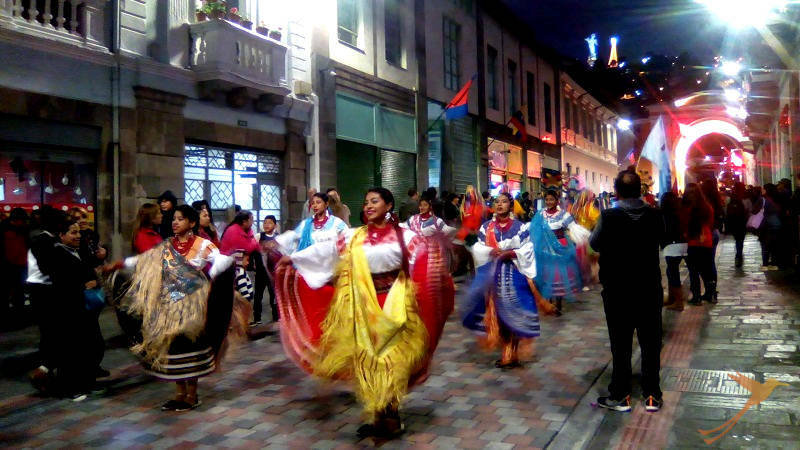 Whenever you are in Quito, during the Fiestas or on other dates, the Ecuadorian capital is always worth a visit. Enjoy the historic center, the monuments and sights of the city for example on our Andean Highlights tour.